The Palm Jumeriah Boardwalk, built over the rocks of the Palm’s breakwater is six meters wide and stretches along the coast for 11 kilometres. The Boardwalk features beautiful views of the Arabian Gulf as well as Dubai’s famous skyline; also home to refreshment and souvenir concessions including a line-up of food trucks. Future development includes various retail promenades and piers which will stretch over 100 meters out to sea for spectacular views. Crash test certified shallow foundation bollards were chosen to secure the boardwalk perimeter. The area had been identified as vulnerable due to it being a crowded space and located directly next to a main road. To protect against vehicle as a weapon attacks; the perimeter was protected with impact test certified bollards. As well as being a busy tourist area, The Palm Jumeirah hosts some of the most famous hotels in the world. The iconic Atlantis Hotel is one of the resident buildings. Part of the protection provided by ATG Access extends to the area in-front of this prestigious structure. As tourists gather to photograph this opulent structure, ATG protects the crowds. 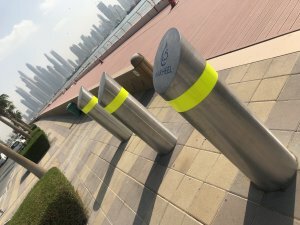 ATG worked very closely with the end-user – Nakheel Developments to ensure the design of the supplied bollard was to their specification and also to project manager the installation of the products. 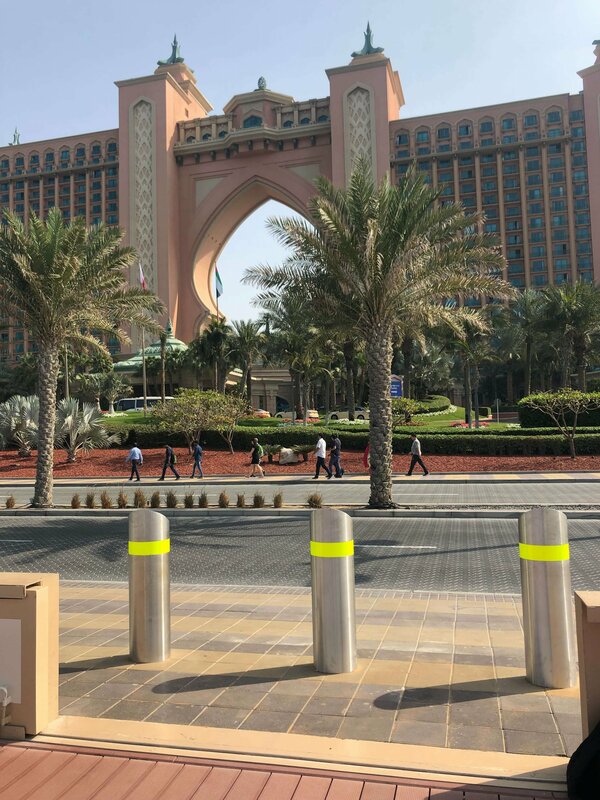 Shallow mount bollards were chosen which enable a very quick and easy installation, avoiding too much disruption for tourists and visitors during the installation phase. Shallow mount technology avoids huge excavation of an area as bollards are mounted to a steel plate which is only 112 mm in depth. Products can be connected prior to delivery on site to also speed up the installation process for particular busy areas. As part of the product’s design, the impact tested steel core can be fitted with an aesthetic sleeve to suit client / site requirements. In this instance, Nakheel Developments chose to brand each sleeve with their company logo.